It should be no shock that after learning a few basic cellular phone camera tips, you will be able to improve all of your photography. Yes, even by using a simple camera phone. Here are 6 cell phone camera tips. The biggest limitation of cellular phone cameras is with the lens. Although we are on the brink of designing tiny zoom lenses for cellular phones, current camera phones don't allow you to zoom in. You can crop later when you do your photo editing, but you'll get better pictures by coming in close to your subject when you are taking your photographs. Try to fill your frame with your subject. This will eliminate distracting backgrounds. New cellular phone cameras are coming out with bigger and bigger sensors which means better digital photos for you. Bigger camera sensors and more camera memory will give you the opportunity to take great photos once you have learned a few digital photography tips on this web site and from other sources as well. The biggest challenge for camera phones is not having enough light. The sensors are small and quality suffers even more so that with large DSLR sesnors under low lighting conditions. Most cell phones don't come with a very powerful flash for lighting. When it's dark the camera phone has to use a slow shutter speed and that can lead to blurry or un-sharp photos. Look to see where the existing light is coming from. 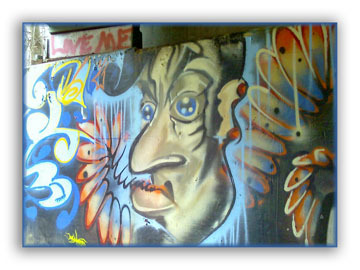 I took this camera phone picture with my old cheapo Motorola cell phone during a morning jog underneath a highway underpass. There was a nice large, soft light source and brought out the colors in the graffiti as well as the textures of the concrete wall. In Adobe Photoshop, I used the sample tool to match one of the colors in the artwork and created a border around the photo. Most of the light was coming from the open sky to the left. If you are indoors, you can move your subject closer to a window or at least have them face toward the window. If it's possible turn a light on in the room. Cellular phone cameras do a bad job with photo exposure if the main light source is behind your subject. A good photo tip is to have the light coming behind you, the photographer. There are more photo lighting tips if you scroll down in the article called take better digital pictures. This will prevent blurry photos. There is no viewfinder to look through, so you can't hold a cell phone camera against your face to keep it steady Find something sturdy to lean your hands or elbows against. If that's not practical, take a relaxing breathe in. Exhale halfway and squeeze your shutter button gently. Then wait until after you here the "click" of the camera to begin moving your hands again. This is one of those cellular phone camera tips that applies to all cameras. Keeping your digital photos sharp is very important if you want to do any photo printing. When you are viewing your photos on your computer you have a resolution of only 72 or 96 dots per inch. Photo printing is done at a much higher resolution, usually 250 dpi (dots per inch); so you see a lot more details. You may be satisfied with lower quality photos if they are for your online photo album, your LinkedIn photo, or Facebook profile. There is this annoying thing we call shutter lag. It's the delay from when you push the shutter button to when the photo is actually taken. More expensive point and shoot cameras and dSLR cameras have almost no shutter delay. With cellular phone cameras the exposure is made after a small but irritating delay after you push the button. So, the tip is to anticipate your photographic moment and squeeze the camera shutter button early. Avoid this common photo mistake and you'll be more pleased with your photographs in the end. This tip is just about obsolete at this point. We upgrade our phones so frequently that we are getting advanced technology each time we do. If you have a really old phone or a cheap cell phone camera with a crappy sensor you can use all these tips and still be very disappointed with your digital photos. It definitely helps if you have the best cell phone camera with a decent sensor. Although the software built into your camera phone is good, it's not as good as the software on your computer or available on the internet such as Gimp or Picasa. Do your photo editing later when you have a few moments of quiet time. Although as cellular phones become more sophisticated, many users are finding the use of apps (software applications) on their cellular phones very easy and very helpful. There are thousands and thousands of apps, many of them are really cool and many of the apps for your cellular phone cameras are free for download. Another option to do your photo editing are the hundreds of more sophisticated photo editing programs that you can tinker with on your computer. Develop a child like curiosity in finding ways to improve and expand your creativity. Consider Cell Phone Camera Accessories. One of the more interesting ideas to try is to add a Cell Phone Camera Lens. Take advantage of all of the camera tips on this website and always make sure you have fun with your digital camera, whether it's a cellular phone camera, a point and shoot her a digital SLR camera. 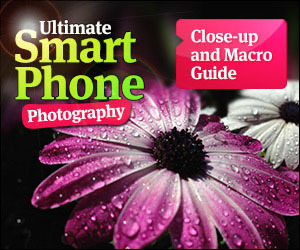 Many of these cellular phone camera tips can be used when you are using a more expensive digital camera too. It's just that you need to be aware of the limitations of a cellular phone camera. Happy Shooting! Some cameras are not automatically set at the highest quality setting. This might include your cell phone camera as well. Get into your mobile phone camera settings and make sure it's set to the maximum resolution. You can always reduce the file size later when you edit.